The state of Minas Gerais in Brazil has been famous for fine colored gemstones for nearly 300 years. The state boasts significant deposits of topaz, aquamarine, chrysoberyl, emerald, tourmaline, kunzite and morganite. Mining began in the region in 1719 with a gold rush, and continued with the discovery of rich topaz deposits in the mid-1700's. Imperial topaz is golden-orange to orange to pink, pinkish-red or violet in color, and can sometimes be confused with the more prosaic citrine quartz found elsewhere in Brazil. 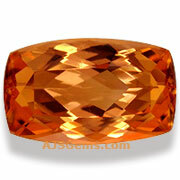 But gemologists can easily identify imperial topaz by its superior hardness, brilliance and density. Indeed the names imperial topaz and precious topaz were introduced to emphasize the rarity and uniqueness of this special topaz. Common yellow topaz is colored by so-called color centers, small imperfections in the crystal structure which which change the way the crystal absorbs light. The very rare pink or red colors are caused by traces of chromium. In the rare case where both conditions are present -- color centers and chromium -- an orange color is the result. The color of true imperial topaz is always natural. Treated gems are not regarded as genuine imperial topaz in the gem trade. 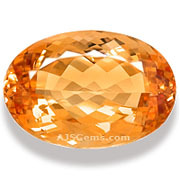 Orange-colored topaz is sometimes produced by irradiation of pale brown topaz, for example, but the color is not stable and these poor imitations are often sold in large sizes at low prices. 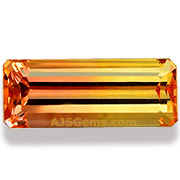 Gem collectors search out only the natural untreated imperial topaz. 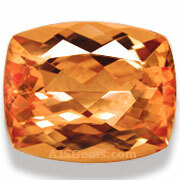 The rarity of imperial topaz results in a significant price difference compared to common blue, white or yellow topaz. Where the blue topaz produced by radiation and heat treatment sells for a modest $10/ct, imperial topaz can easily reach prices of $1,000/ct for fine stones over 5 carats. Prices for specimens with a pinkish hue tend to be higher, and rare bi-color stones (orange/golden or pink/golden) also carry a premium. A truly red untreated topaz would count as exceptionally rare. This month we feature new additions to our collection, including a large unheated yellow Ceylon sapphire and fine aquamarine and sphene from Madagascar. One of the finest colors we've seen in an unheated yellow sapphire. This 14.60 ct Ceylon beauty has very fine crystal, and we've graded it "almost loupe clean." Wonderful color saturation in a true canary yellow, this gem has amazing brilliance. A fine collector's gem, this will make a spectacular ring or pendant. 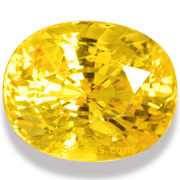 Certified by GemResearch Swisslab (GRS) as unheated, origin Sri Lanka, with color stated as "vivid yellow." A very fine aquamarine from Madagascar in a large size, over 19 carats. 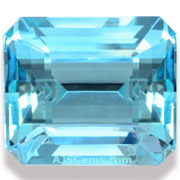 A lovely sea blue, this gorgeous gem combines excellent color saturation with superb clarity and precision cutting. Completely natural and untreated. Perfectly sized for a stunning ring or pendant. 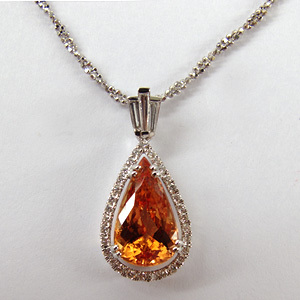 We continue to add to our collection of rare imperial topaz. This gorgeous sherry-colored gem is exceptionally clean (graded "loupe clean") and beautifully fashioned in a portguese cut cushion shape. Completely natural and untreated. We have just acquired several new high quality sphene from Madagascar. 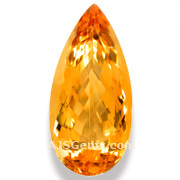 Thsi 14.80 ct trillion is an incredibly bright stone that positvely glitters. 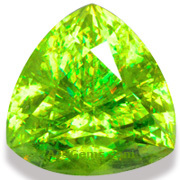 Beautifully cut with a high crown to maximize dispersion, this gem has a unique glow that you will find in very few sphene. Completely natural and untreated. Gold prices fall sharply -- correction or start of bear market? Gold prices fell dramatically to a 2 year low last month, leading to speculation that the luster is off the precious metal. Though the gold price appears to have bottomed out for now, it fell below $1,400 on April 15, down off its high of $1,800 last October. The selloff was sparked by expectations that the US Federal Reserve would tighten monetary policy, which would reduce inflation and give investors less reason to hold gold to avoid a corresponding decline in the value of cash investments. The Princie, a 34.65 ct. fancy intense pink cushion cut, was sold for $39.3 million ($1.1 million a carat) at Christie’s in New York, making it the most expensive gem ever sold in the auction house’s 200-plus year history. The diamond came from the famed Golconda mines of India and was originally owned by the Nizams of Hyderabad. 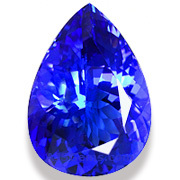 When a color change gem is described as having a "75% color change" it usually refers to the percentage of the surface area that changes color under varying light. While a higher percentage is better, this is not the only or even best metric of quality for color change gems. Gem dealers also look for the strength of the color change, where that is defined in terms of the difference between the two colors. A green to red color change, for example, is a stronger change than that from violet to blue. The markets for gold and gemstones are actually quite different, and prices often move in different directions. Gold prices are strong affected by the paper market, and it is weakness in the paper market, not physical demand, that has caused the recent drop in gold prices. Colored gemstone prices continue to go up strongly, due to increased demand in the developing world (especially China). Lower gold prices in fact tend to increase the demand for gemstones, since gold jewelry becomes more affordable.